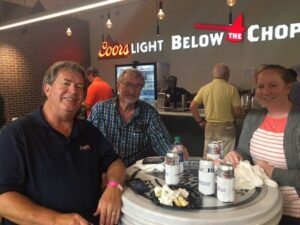 Shelby Hercules, Staff Geotechnical Engineer from our Kennesaw office, took a moment to wind down and enjoy a Braves game at the new SunTrust Ballpark. The evening “Below the Chop” was coordinated by the ADSC Southeast Chapter, International Association of Foundation Drilling. Shelby was in good company with Denny Meier, Atkins, and Bubba Knight, Loadtest. Go Braves!